This is a diamond shape fit for royalty. Overflowing with beautiful brilliance, the oval-cut diamond showcases a unique and elegant look with the added advantage of being highly durable for active lifestyles. The exquisite oval-cut diamond’s brilliance is rivaled only by its round brilliant-cut counterpart. In fact, the two shapes share a similar faceting structure and proportions. If you appreciate the brilliance of a round diamond but want something more unique, the oval-cut diamond just might be your perfect match. The oval-cut diamond features an asymmetrical and elongated shape with 58 facets. Invented in the 1960’s by Russian diamond cutter Lazare Kaplan, modern oval-cut diamonds are essentially a modified brilliant-cut that radiate exceptional fire and brilliance. That means that, structurally, an oval-cut diamond is similar to the round brilliant shape. For example, both styles contain 58 expertly-cut facets to maximize exceptional brilliance. For those with their hearts set on a luxurious yet unique shape, the elongated design of the oval-cut is as durable as it is beautiful. The symmetrical curved shape of the oval-cut diamond suits those who have an active lifestyle. Because it does not have any pointed edges, the oval-cut is less likely to snag during regular activity, and therefore less likely to chip. Are Oval-Cut Diamonds More Expensive? Since the shape of a diamond directly affects its price, it is especially important to consider which shape you prefer. For instance, round stones tend to have the highest price point of all diamond shapes simply due to high market demand and manufacturing costs. Because an oval-cut diamond has a larger surface area than other stones of the same carat weight, consumers who purchase an oval-cut diamond can get a diamond that appears to be larger for a lower price. The oval-cut features a brilliance similar to the more expensive round brilliant-cut while the length of the oval-cut makes the diamond appear to be of a larger carat weight. If you or your partner is searching for a beautiful sparkle and the allure of a larger stone without spending more than you have to, the oval-cut offers a less expensive price point without sacrificing shine. What Causes the “Bow-Tie Effect” in Oval Diamonds? When light passes through a diamond and casts a shadow across the central facets of the stone, a “Bow-Tie Effect” is the result. The shadow creates a dark space across the center of the stone and it can detract from an oval diamond’s brilliance. All oval-cut diamonds will show some degree of Bow-Tie Effect. However, the degree depends on the diamond’s symmetry and cut ratios. These can differ from being nearly invisible to more severe. As a general best practice, purchasing an oval-cut diamond with an ideal length-to-width ratio range of 1.35 - 1.50 makes a severe Bow-Tie Effect less likely. When shopping for and evaluating oval-cut diamonds, it is important to note that you will only be able to notice this effect by visually inspecting the diamond. This means that the Bow-Tie Effect severity cannot be determined just by looking at the grading certificate or dimensions of the diamond. Because a severe bow-tie will take away from the beauty and brilliance of the oval-cut diamond, we strongly recommend visually examining any oval-cut diamond prior to purchasing it. Unlike most other diamond shapes, such as round brilliant-cuts, there is no overall cut grading for oval-cut diamonds. Because an oval-cut diamond’s certificate does not usually represent the stone adequately, we recommended examining any oval-cut diamond closely in-person. Do Oval-Cut Diamonds Look Bigger? Due to its elongated shape, an oval-cut diamond tends to appear larger than it actually is. When compared to round diamonds of a similar carat weight, the oval-cut creates the illusion of being much larger in stature. This optical advantage occurs thanks to the oval-cut’s larger surface area as compared to a round diamond of the same weight. For example, when comparing a 1-carat oval diamond to a 1-carat round, the oval-cut boasts 10 percent more surface area due to its shape. As a result, the oval-cut has gained popularity in recent years as center stones for engagement rings. Just as the oval-cut’s shape helps the stone look bigger, its oblong shape can help fingers look longer as well. GSL measures each diamond using the carat weight system. Diamond experts use specially calibrated scales to ensure accurate measurements with weights measured to the hundred-thousandths of a carat. One metric carat equals 0.2 grams. As a reminder, the oval-cut tends to have a larger physical appearance for their carat weight when compared to other diamond shapes. The industry standard diamond color grading system begins with a D grade (colorless), continuing alphabetically with increasing levels of color to a Z grade. Diamonds are compared to master stones that have known color grades. In fact, GSL only uses master stone sets that are tested to meet rigorous standards prior to use. To the human eye, diamond color is closely tied to the size of the oval-cut diamond in question and its setting. Small differences in diamond color are very difficult for the naked eye to see, but may still account for a large difference in the price of the oval-cut diamond. Additionally, the setting color and material chosen for your oval-cut diamond can make a significant difference in the appearance of the diamond’s color. According to industry standards, traditional diamonds should always look colorless against their settings. For this reason, we strongly recommend keeping your desired setting in mind when shopping for and evaluating the color of your oval-cut diamond. Diamond experts calculate an oval-cut diamond's length-to-width ratio by dividing the length of the diamond by its width. This ratio helps determine how proportionate the diamond is to its intended shape. Personal preferences should take priority for how tall or squat your oval-cut diamond should be. A classic oval-cut length-to-width ratio is 1.35 – 1.50, but this is entirely subjective. 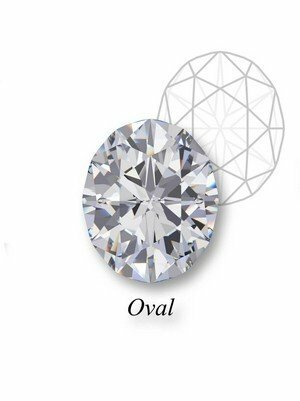 We recommend analyzing a variety of oval diamonds to determine your preferred ratio. A diamond’s depth refers to the distance between its culet and its table when visualized from the side. The depth percentage of a diamond is calculated by dividing the depth by the width of a diamond. An oval-cut diamond with a lower depth percentage will appear to be larger when considering its carat weight. This occurs because oval-cut diamonds with lower percentages have larger widths than depths. Diamonds featuring an oval shape were first introduced over 200 years ago. However, the modern oval-cut as we know it today was invented in the 1960’s by expert diamond cutter Lazare Kaplan of Russia. Before creating the popular modern oval-cut diamond shape, Kaplan rose to prominence in the diamond industry for his unique ability to split rough diamonds into smaller stones with a single blow. This process is known as “diamond cleaving”. With his uncanny cleaving method, Kaplan took stones previously labeled “unworthy” and turned them into beautiful diamond creations. Kaplan’s full talent came to light after he invented the modern oval-cut diamond shape. This creation eventually earned him a spot in the Jewelers International Hall of Fame. In recent years, the modern-day oval-cut made headlines when Prince William proposed to Kate Middleton, placing his late mother’s 12-carat oval blue Ceylon sapphire engagement ring on his bride-to-be’s finger. Though they are relatively new to the diamond industry, oval-cut diamonds are very popular as center stones for engagement rings. The oval diamond gives off a level of brilliance second only to that of the round brilliant style. Despite that, oval-cuts tend to look larger and cost less when compared to the round shape. The shape of the oval-cut diamond gives this cut many benefits such as a larger-looking surface area, a durable and chip-resistant design, and an elegant charm that makes fingers appear longer and perhaps daintier. For a diamond with a unique yet delicately feminine shape, explore the Zales selection of high-quality oval-cut diamonds.